Overwatch holds their Halloween Terror Event around this time every year, and we’re always blessed with great new skins. Doomfist’s skin derives inspiration from the classic Swamp Monster, and perhaps more specifically, Mokele-mbembe. This creature is from African folklore where many people claimed to see a aquatic reptilian or dinosaur-like scaley creature lurking about the Congo River. 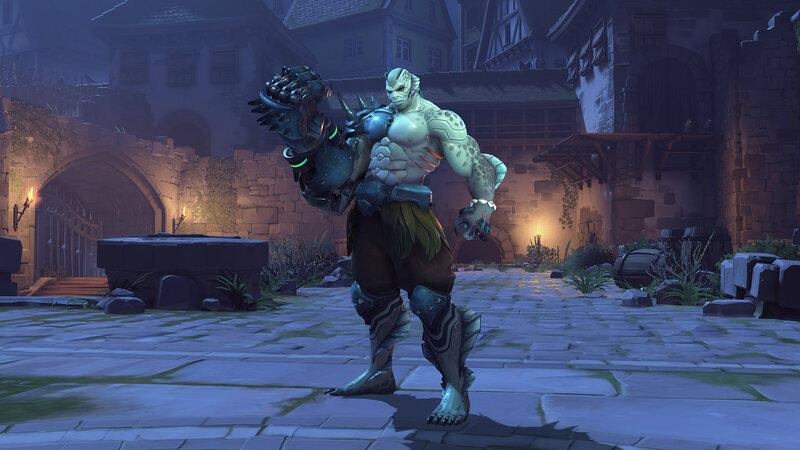 Blizzard’s never come out and said this was the inspiration behind Akande Ogundimu’s latest skin, but it seems like a reasonable fit! Doomfist is from Nigeria, and while the Congo River doesn’t necessarily pass through that country, I’m sure the stories about Mokele-mbembe do. Either way, this skin is amazing. I just wanted to point out that the shell bracelet is hilarious! 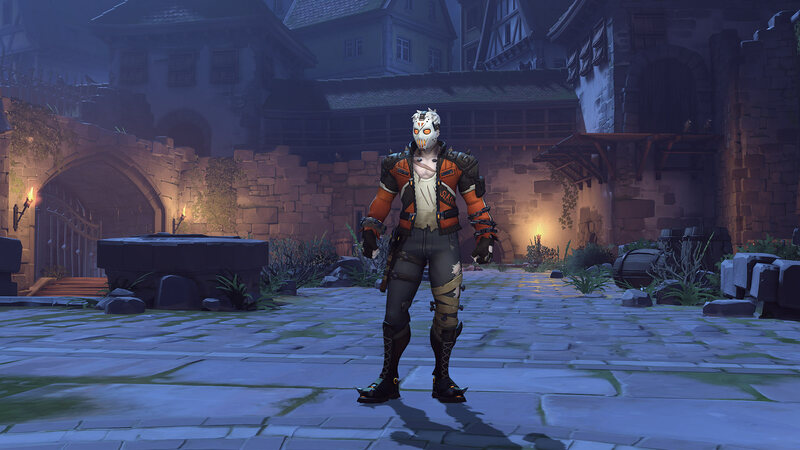 Soldier: 76 received probably the best addition to the Halloween skin catalogue this year. Drawing inspiration from Friday the 13th‘s Jason Voorhees, Slasher 76 doesn’t really… “slash,” per se, but he could if he kicked you with those spiky boots! He’s got the classic hockey mask that Jason wears, too, so it’s especially effective for a surprising flank! It’s a common misconception that Frankstein is the monster, but Frankenstein is actually the mad doctor who creates the monster. In this case, Junkrat and Roadhog play the parts of Junkenstein and Junkenstein’s Monster respectively. 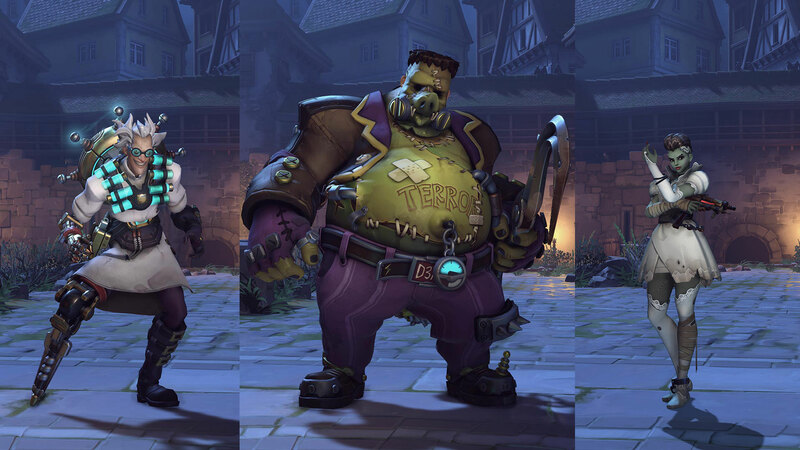 These two skins have been around since the first Halloween Event in 2016 and both are featured in the PvE Arcade Mode, Junkenstein’s Revenge, but they’re just too good to not feature (especially for being the poster-children of the Overwatch Halloween Terror Event). This year we got the lovely addition of Sombra as “Bride”, but I think we can all agree that she’s meant to be the bride of Junkenstein’s Monster, sporting the white streak in her hair, similar to Elsa Lanchester’s portrayal of the Bride. These are just a few of our favorites, but we have to give honorable mentions to Enchanted Armor Pharah, Jack-O-Lanturn Wrecking Ball and Banshee Moira. Which Overwatch Halloween Terror skin is your favorite? Let us know on Twitter!